The number of deaths of Palestinian children from the war on Gaza in summer 2014 was somewhere between 495 and 578, not civilians of dubious origin, but children, with the OCHA going for 551. Five hundred and fifty-one. Why can’t we count all of the dead children? Maybe because they’re children and are more easily evaporated by heavy ordnance, but that’s just one theory. But … we just don’t seem to hear about this, indeed, we don’t even think about this. If you read, say, the threads on The Economist’s FB page, this wholesale slaughter just doesn’t come up. There’s all mention of Israel as a beacon of democracy in the Middle East, or the intricacies of how Netanyahu must negotiate hardliners and moderates in the Knesset, all this armchair, arm’s length wankery. 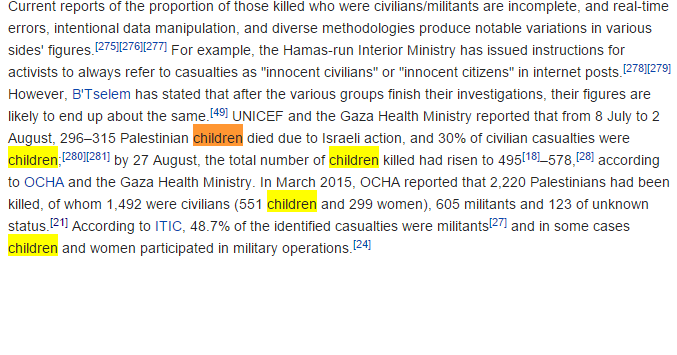 Just a few days ago The Economist (respected, intellectual international journal, wrote up about the feted Israeli press coming under some sinister attention from Netty … but in the article, pasted in full under the Wiki box, doesn’t mention the wholesale slaughter of children from just last year. No mention. I can see from an editorial perspective maybe the mass murder of children isn’t actually relevant to an article about Netty having Orwellian designs on Israel’s free press. But my point is, such a concern surely is already moot, because the threat’s already materialised in this truly frightening ability for all these commentators and observers to just self-censor, to not mention it, it’s simply not part of their analyses or thinking. I get the impression that it’s beyond inconceivable, for them, the matter of associating Netty with mass infanticide simply just does not exist as a concept. It’s like trying to have a discussion about morals and ethics with a tarantula, it simply stares at you, not because it doesn’t understand what you’re saying or it lacks the capacity to understand as such, it just doesn’t engage with such values at all. It’s all just noise. ONE of Israel’s proudest claims—and one that has helped shore up support in Western capitals—is that it is a beacon of democratic politics in a region with precious little of the stuff. Although its democracy is not flawless, Israel has a fiercely free and irreverent press. The media have brought down ministers and generals, including forcing the resignation of Yitzhak Rabin as prime minister in 1977, when Haaretz revealed that his wife had an illegal bank account. Yet this proud tradition of holding leaders to account is under threat. Even as Binyamin Netanyahu worked against the clock to assemble a governing coalition in May, he ensured that the leaders of parties who joined it committed themselves to supporting unspecified “sweeping reforms” in the media sector that would be brought in by the communications minister. This clause in the coalition agreement was made non-negotiable. Not made clear at the time, however, was that Mr Netanyahu had no plans to appoint a communication minister—since he has kept the portfolio for himself. In this section Neither a sprint nor a marathon Problems at the pump Dark days ahead The fortunes of war A country apart Cross channels Reprints Related topics Consumer Cyclicals Media industry Consumer products Arts, entertainment and media Media The implications of this are now becoming clear. Relations within Mr Netanyahu’s previous cabinet were poisoned by a proposed law that might have reduced the circulation of Yisrael Hayom, a daily freesheet owned by Sheldon Adelson, an American casino mogul. It slavishly supports the prime minister and his policies and was seen as so partisan and influential that some Knesset members want to force it to charge a minimal price. Mr Netanyahu has since ensured that members of his new coalition are barred from voting in favour of such a law. But the new communications minister has even grander designs. Channel 10, an independent and financially strapped broadcaster which screened critical documentaries on Mr Netanyahu’s financial affairs, said that he had hiked its licensing fee to about $4.3m, four times the sum recommended by his bureaucrats and maybe enough to force it off the air. Two prospective investors whose support was crucial to saving the channel from bankruptcy have bowed out, citing “changes in the regulatory climate.” Further steps are now being mooted. These include cancelling the state-owned Israel Broadcasting Authority’s right to charge a fee from the viewing public, forcing another struggling terrestrial channel to break up into two and allowing cable and satellite channels to broadcast news. Mr Netanyahu believes that the local press is dominated by the left and out to get him. In private he has expressed his desire to “even the picture.” He is not totally wrong. Most Israeli journalists are of a more liberal bent than the Likud government, and the largest media group, Yediot Ahronot, has relentlessly criticised the prime minister. The opposition leader, Yitzhak Herzog, last week accused Mr Netanyahu of “learning the tricks of [Turkey’s president] Erdogan.” This is an unfair comparison: unlike Turkey, Israel hasn’t imprisoned dozens of journalists. A more useful comparison might be to Italy under Silvio Berlusconi. Mr Netanyahu does not have il cavaliere’s deep pockets, but some of his patrons do. The prime minister’s office insists that his sole motive is to open the media industry to competition. Yet small independent media companies tread a precarious path and criticise the prime minister, who is also their chief regulator, at their peril.